The UK is wet, we all know that, but what falls from the sky isn’t an indication as to how much water we have available to us for our own use. This is limited to how much we can store. With population rising, summers getting dryer and the UK’s water sources becoming more and more stressed, it is no wonder rainwater harvesting is a popular addition to many new build properties. But what are the real benefits to the home owner and the developer? We will take a look in this handy article. Many water saving solutions like low flush toilets and low flow shower heads, will effect the consumers day to day living. We all love a high flow shower, but including these in a home increases the volume of water consumption. Recycling the rainwater from the roof for use in the toilets, garden taps and washing machine can save 40-50% of mains water usage, therefore allowing people to have higher flow showers and still be reducing their overall water consumption. Certain parts of the UK have very hard water. Limescale is a problem which builds up and reduces the life of appliances, especially ones that heat up water like washing machines. Rainwater is soft and doesn’t deposit limescale which increases its lifespan. SUDS (sustainable urban drainage systems) is a consideration in all urban development. Surface water drains are reaching capacity and there is a driver to ensure we manage stormwater effectively to prevent localised flooding. 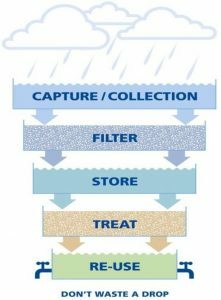 Rainwater harvesting is the collection and reuse of rainwater from the roof. The inclusion of rainwater harvesting in a new build will have a significant impact on the volume of water sent to the surface water drains which will in turn help alleviate local flooding. 1. Dual plumbing – There must be a dedicated plumbing circuit to the toilets, washing machine and outside tap. It must be marked with tape to ensure it is not mistaken in the future and used for drinking water. 2. 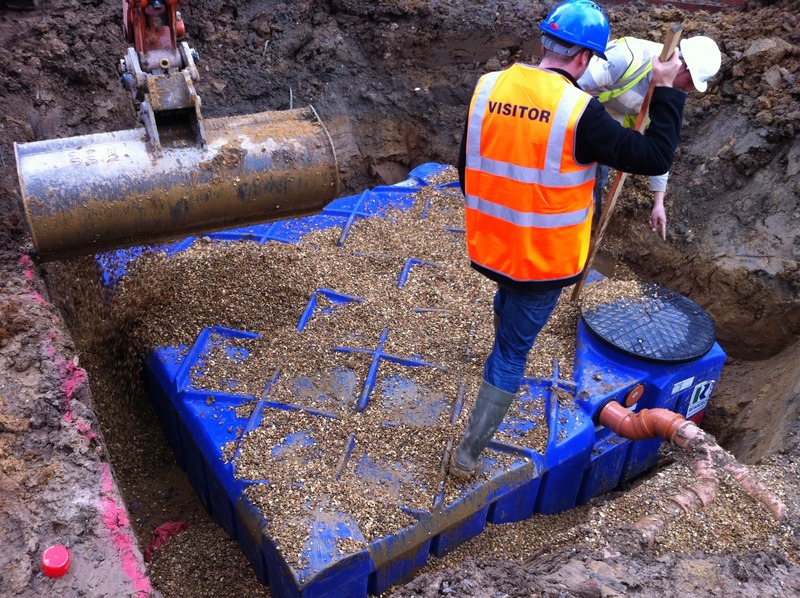 Tank location – The rainwater tank should not be installed too deep in the ground. Most tanks come with built in leaf filters, if the tank is installed too deep, it becomes hard to clean the leaf filter. If at all possible, keep the inlet pipe around 600mm below ground and always use a tank with a 600mm diameter opening to make is easy for the home owner to perform simple maintenance. 3. Protect the pump – all systems require a pump to bring the water from the pump to the toilets. These pumps are pressure operated. Any leaks in toilet valves or dripping taps can make the pump turn on and off. Adding a simple pressure vessel to the system will prolong the life of the pump and ensure the system doesn’t cause any problems for the home owner. 4. Take specialist advise. Many companies are selling rainwater harvesting systems, buying from one that really knows and understands the system well will pay dividends when you need to pick up the phone and ask a question. Making mistakes is costly to rectify, therefore having the support and back up from your supplier is imperative. 5. Ensure you have bought high quality components. The working components of a rainwater harvesting system are the pump, and the mains water top up kit. Ensuring you have a pump by a leading manufacturer and a good quality mains top up kit is imperative. Alternatively, if you would like to speak to our rainwater specialist, contact Paul on 01844 877032.